Looking for the best chocolate chip cookies EVER? you’re in the right place. These cookies are BIG, soft, chewy, and totally divine. 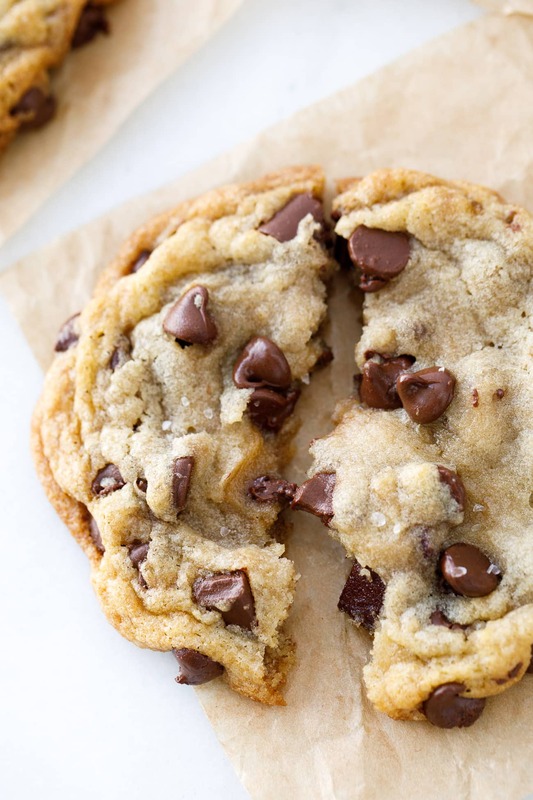 Chocolate chip cookies are my weakness. If I were ever stranded on a deserted island, I could be happy with a steady supply of homemade chocolate chip cookies. 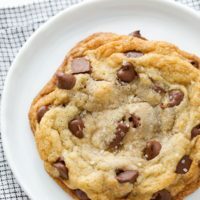 I swiped this recipe for the best chocolate chip cookies from my mom, and now I want to share it with all of you. You don’t want to keep going through life not knowing what’s in the best chocolate chip cookies EVER, do you? Well, these wonderful homemade cookies are loaded with some incredible ingredients. Butter, sugar, vanilla and semisweet chocolate chips are among the usual suspects. 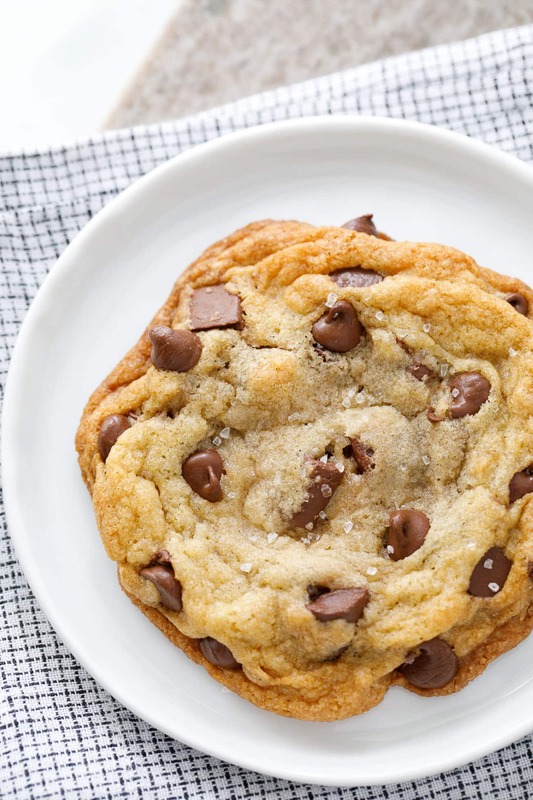 But this isn’t your average chocolate chip cookies recipe! Y’all, this recipe produces some pretty perfect cookies. In a separate bowl, beat together the butter, sugars, vanilla extract, and the vinegar until smooth. Beat in the egg just until combined. Mix the flour mixture into the wet mixture just until combined. Stir in the chips. Drop cookies 2 inches apart onto your prepared cookie sheet (here’s my favorite one). TIP: In the recipe, I make a note about “barely melted” butter. You want to melt it, but not over melt it, and be sure to let it COOL a bit before putting in with the other ingredients. Here’s a picture of what your butter should look like! 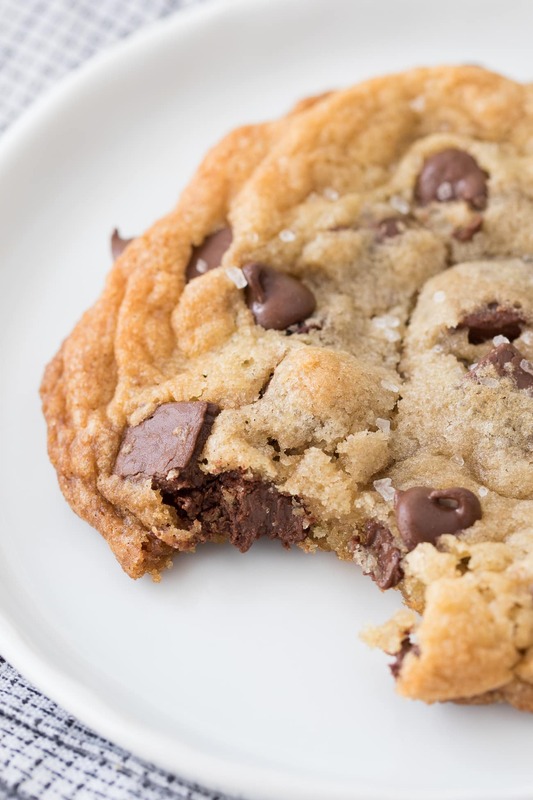 The debate on soft vs. crispy chocolate chip cookies is a no-brainer in my book. I do favor soft and chewy, but these cookies give you the best of both worlds. The middle of the cookie is nice and soft, and the outer edge has a little crispiness. And that sea salt on top? Just, wow. A wonderful tip that I picked up a few years ago was to store cookies in an airtight container with one slice of white bread. The cookies utilize the moisture in the bread and it helps prevent them from drying out. Give it a try, you’ll love the results. People always ask me if they can freeze my cookie recipes. In this case, yes, you can definitely freeze this chocolate chip cookie dough. Here’s how to do it. Make the cookie dough as instructed below. Scoop (I’m obsessed with this OXO cookie scoop) and place cookies on a parchment-lined baking sheet. Just make sure the sheet will fit in your freezer. Freeze the balls until solid. Usually, 1-2 hours will suffice. Remove the cookie balls to a large ziptop bag and carefully labeled with the date and baking instructions. Freeze up to 6 weeks. To bake your amazing cookies, you can allow the dough to defrost overnight in the refrigerator or a couple hours at room temperature, then just bake as usual. If you want to bake them from frozen, just let them sit out on a parchment-lined baking sheet while your oven preheats, and then bake as usual adding 1-3 minutes to the baking time. You’ll just need to keep an eye on your oven to make sure you don’t let them go too long over the original bake time. Don’t forget, as my instructions note below you don’t want to overbake these cookies. They will look a little underdone in the center but they will continue to cook once you take them out of the oven as you allow them to cool on the baking sheet an additional 10 minutes. I think you’ll agree that these truly are the BEST chocolate chip cookies! 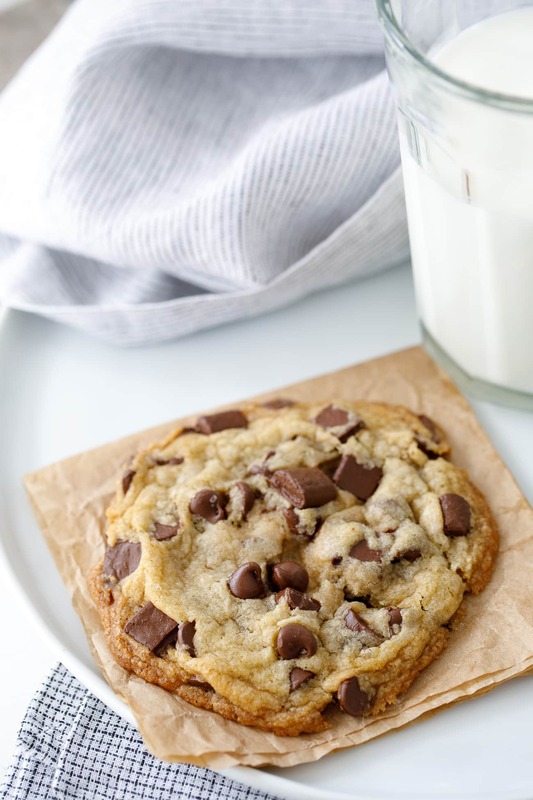 These big soft chocolate chip cookies are truly perfect! In a medium bowl mix together the flour, baking soda and the salt: Set aside. 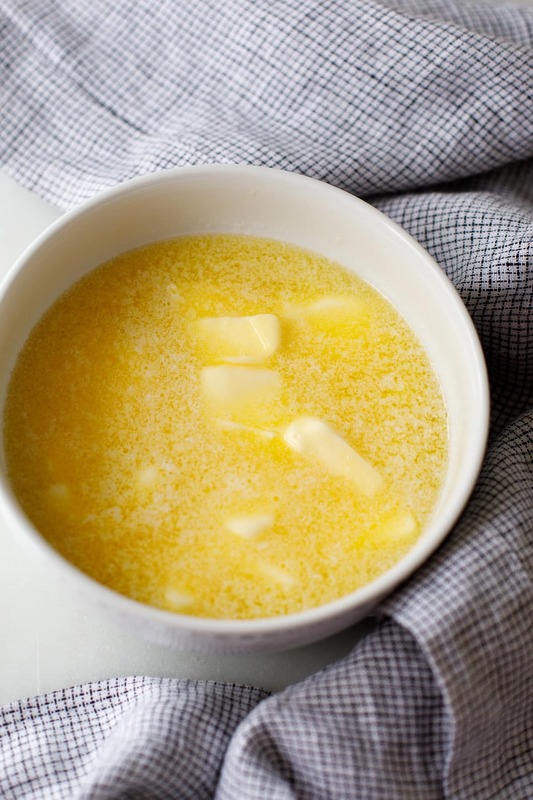 In a large bowl beat together the butter, sugars, vanilla extract and the vinegar until smooth. Beat in the egg just until combined. Using a large cookie scoop (about 2 rounded tablespoons) drop about 3 inches apart onto cookie sheet. Bake for 8 to 10 minutes, they will look light brown around the edges and will look underdone in the center. Remove from the oven and immediately sprinkle each cookie with a little sea salt. Allow to sit on the sheet for 10 minutes before moving to a rack to cool. You can use a medium cookie scoop for regular size cookies. 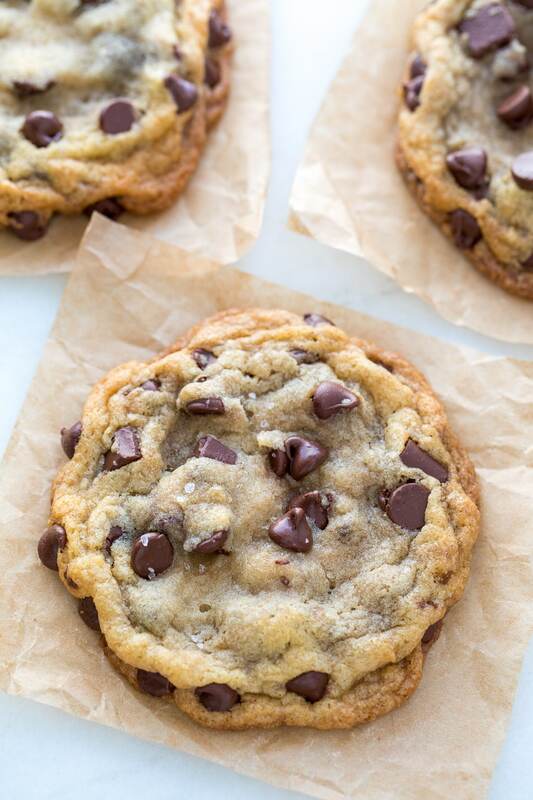 These are absolutely the best chocolate chip cookies yet. I made a batch for my church small group and they ladies loved them. Certainly a recipe I’ll make again and again. The texture was great , the taste was out of this world. Karen, I am SO GLAD you loved my chocolate chip cookies. This is one of the best recipes on my blog, but, it hasn’t really caught fire on social media yet. I feel like people are really missing out! 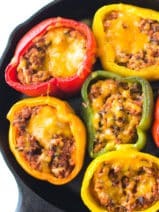 :) Be sure to pin this recipe on Pinterest and share with your Facebook friends so others can enjoy this great recipe. Thanks for commenting! This look absolutely amazing. I’ve always been a fan of the Mrs. Field’s recipe for chocolate chip cookies, but I will have to give these a chance. One of things I normally struggle with is having cookies turn out the same every time. How is this recipe for that? Made these tonight with my 10 year old for school lunches. They are delicious! And my boys love how big they are! We did cook them a bit longer. About 12 mins but we like a more ‘done’ cookie. 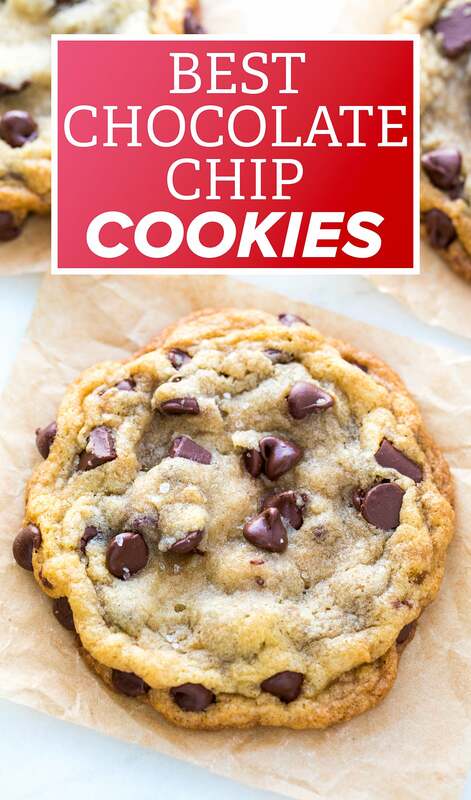 I’ll put these at the top of our cookie list! Kendra, so glad you love them!! Yes, cooking a touch longer would create a crispier, but still good cookie. We like ours very soft in the middle! :) Thanks for commenting!!! 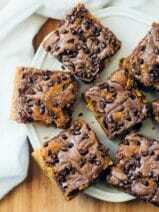 By far the best recipe I’ve found for chocolate chip cookies. I don’t sprinkle the sea salt. My kids love them, as well as their friends. It’s chewy and crispy. I like the added apple cider vinegar. I think it adds to the overall cookie to make it better. 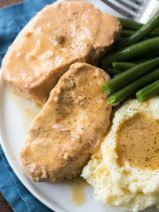 Can you modify this recipe for gluten free needs? Hi Liz, I haven’t tried it with gluten-free flour. I might give it a whirl soon. I’ll reply on this comment again if I do. Thanks for commenting! These are hands down the best chocolate chip cookies!! 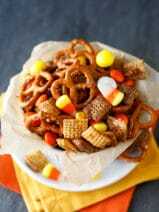 Finally had the opportunity to make and this will be the recipe I use here on out for CCC!!! Question: What does the Apple Cider Vinegar do for the cookie? Always, trying a new CC cookie recipe – obsessed to finding the perfect one. Can’t wait to try! Hi Tina! It helps cut the sweetnes a bit and it reacts with the leavener to give the cookies some added lightness! Hey Lori, it’s toward the bottom of the post! I am all about soft and chewy cookies, but like the crispy edges on your cookies.